The unique tool storage bag is coming tomorrow. Be sure to check out my online store tomorrow and get your Stamparatus bag. It’s a great way to keep your special tool safe and secure. This way you can carry it wherever you go. I know I love taking mine with me. We have waited and waiting for this wonderful bag and now it’s finally here. Tomorrow is the day. Are you as excited as I am? Treat yourself or a crafting buddy this holiday season. 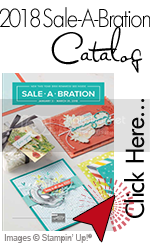 Take a look at the video from Stampin’ UP! for a better look at this new product. It’s such a convenient way to carry the Stamparatus and its accessories. Visit my online store and pick yours up today. Download the flyer here.